Last week, I watched the last manned space flight (for now) take off from Florida to the International Space Station. I’m still amazed at the intensity of the launch and how quickly the shuttle reaches orbit. While watching this historic event via my computer, several questions popped into my head: What’s it like to shoot into space, walk around in zero gravity and how does Astronaut food taste? These freeze-dried curiosities used to only be available at specialty retailers like science museums but can now be found in the checkout line at Fry’s Electronics. They claim to have been used by NASA in current and historic space missions. While I probably won’t be flying to Mars any time soon, I can have a taste of what it’s like to eat in space. Full dinners, snacks and desserts are available freeze-dried and some are ready to eat. But how do they taste? The beef stew dinner is labeled as a complete meal and includes beef stew, corn and instant chocolate pudding– yup, all freeze-dried– in three individual packages sealed in a larger package. The beef is actually covered up in a powdery substance and is only revealed once the boiling water is poured into the bowl. Even then, the presence of beef is minimal. 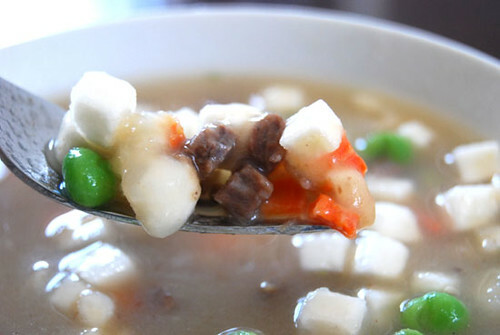 Even after the “stew” had the required time to reabsorb the water, the soup base is a murky gray with floating bits of potato, peas, carrots and beef. For a dish that has 950mg of sodium, this stew was missing something besides flavor. For those adventurous to take this camping, I suggest bringing hot sauce and an iron stomach. The corn side dish is passable but still off and still a bit crunchy even after reabsorbing the hot water. The chocolate pudding is the best part of meal. It doesn’t stray too far from common instant pudding mixes. The entire meal is 300 calories, only 20 percent are calories from fat making this extremely low-fat. But it’s also tasteless with the exception of the pudding. What can go wrong with freeze-dried peaches. Apparently, everything. What I imagine what was once a luscicious peach has been segmented and freeze-dried into withered orange-tinged slices that stick to your teeth. They were bitter with only a tiny bit of sweetness. It’s a hard snack to finish and I think even the ants outside would leave this one untouched. 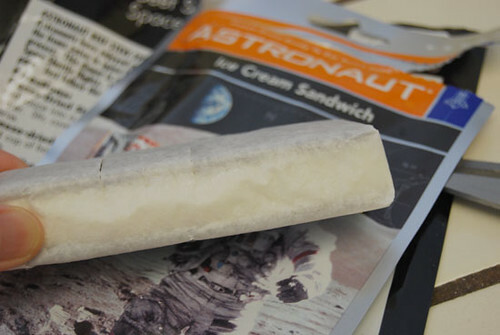 The Astronaut ice cream sandwich comes in a few flavors: cookies and cream, vanilla and neapolitan. For this taste test, I stuck with my tried-and-true favorite: vanilla. Inside the package is a hard, paper-wrapped block of “ice cream.” It resembles the typical ice cream sandwiches you’d get at the store but there’s one difference, this ice cream is crumbly. There’s nothing creamy about it. Still, the calorie count for the ice cream is pretty high at 210 with 70 of it from fat. Ingredients include milkfat, sugar, nonfat milk, corn syrup and a list of other three-syllable words that don’t come from nature. But compared to the beef stew dinner and peaches, this is the best of the bunch. The ice cream texture resembles a meringue and drinking it with a glass of frosty milk may help confuse your taste buds enough to make you think you were eating a decadent dessert. I’m always looking for food to have on hand in case of an emergency, and I plan to stick to dried and canned goods. 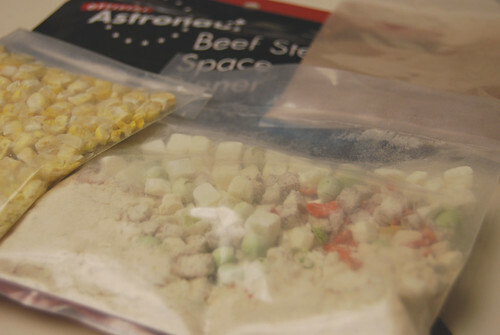 The fun of Astronaut food is merely that: fun. Consuming it as your main meal requires otherworldly taste buds. Oh! I used to love getting astronaut ice cream when we went to the museum or somewhere like that. 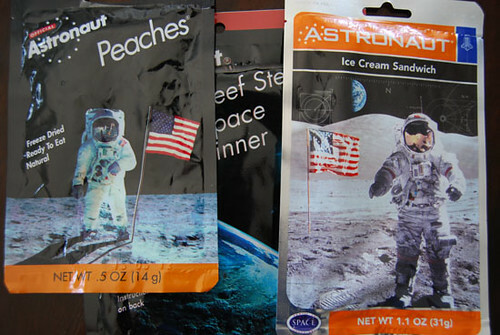 You’d think with all the fancy freeze-dried camping foods out there, they could make astronaut dinners a little tastier. 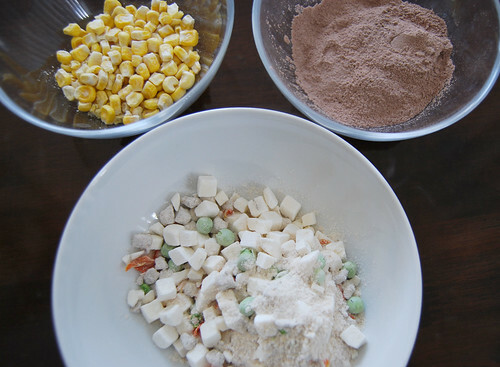 I would definitely eat the ice cream again just because I don’t mind meringue cookies. Poor astronauts. Too bad they didn’t spend money researching better food options for space travel. Maybe they were part of a secret experiment?? 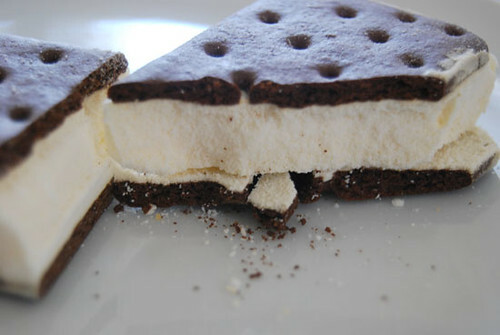 i would totally eat that freeze dried ice cream sandwich! that beef stew looks gross. 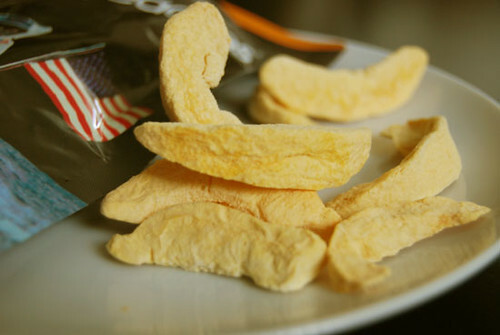 thanks for being a human guineau pig and trying out these, uh tasty dishes. i’m with mary – i feel sorry that astronauts have to eat this stuff. with all this technology, you’d think there’s be better food! Remember when the commercials about Tang as the drink of choice in space? I wonder if there’s any truth to that? If so, I would stick to a juice diet. When I was a kid I wanted to be an astronaut, but my dad said we didn’t have the space. Ha ha ha. I have always seen that in line at Fry’s and never picked it up. Thanks for taking one for the team. Seriously, why don’t they just drink Tang? I think that beef stew affected that one astronaut who wore adult diapers to go after the love triangle lady. I forgot about the astronaut diaper incident! Good point! Thankfully I did not suffer the same consequences from eating the beef stew because EWWWW! That’s a great gift for a boy! I remember doing research a few years ago about where to find MREs and couldn’t find any. Maybe they’re only available to the military?? This deserves a follow up investigation…. You can try in this way, that your brain takes longer to register the fullness sensation then the rate you eat at. If you drink a glass of water before meals and pace yourself when eating, you could eat less or feel fuller earlier, which can help you lose weight.